The Similarity Analysis for documents can be used to check the similarity or dissimilarity of various documents in terms of code frequency. The values of document variables can also be included. Activate all documents you would like to include in the Similarity Analysis. It is also helpful to activate all codes you wish to use for determining similarity. From the Mixed Methods menu tab, click Similarity Analysis for Documents. A window will appear that contains all previously created similarity and distance matrices. Click on the New Similarity/Distance matrix symbol to begin the similarity analysis. 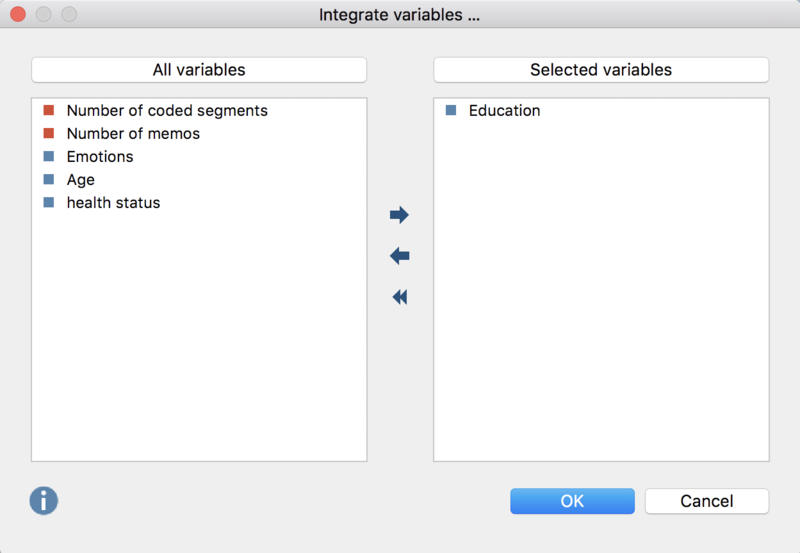 A dialog window will appear in which you can select the codes and variables and specify the type of analysis. In the upper section, you can add the codes you wish to include in the analysis. You can add all activated codes directly via the Paste activated codes button. Existence of code – Generates a similarity matrix that considers only whether the selected codes occur in the document or not. Code frequency – Generates a distance matrix that takes the distance of individual codes into consideration. a = Number of codes or variable values that are identical in both documents. d = Number of codes or variable values that do not exist in both documents. b and c = Number of codes or variable values that exist in only one document. The calculation options differ in, among other things, the extent to which field “d”, or non-existence in both documents, is considered a match. Simple match = (a + d) / (a + b + c + d) – Both existence and non-existence are counted as a match. The result is the percentage match. Jaccard = a / (a + b + c) – Non-existence is completely ignored. Kuckartz & Rädikers zeta = (2a + d) / (2a + b + c + d) – Existence is counted twice, non-existence once. Russel & Rao = a / (a + b + c + d) – Only existence is considered a match, but non-existence reduces the similarity. Please note: If you include more than one code into the analysis that does not exist in multiple documents, it may be better to use a coefficient who ignores non-existing codes (Jaccard) or values them less (Kuckartz & Rädiker zeta, Russel & Rao). Otherwise you may receive a high similarity score, even if the codes are not assigned very differently. The non-existing codes will dominate the existing codes in this case. Squared euclidean distance = The sum of squared deviations (higher deviations will be rated higher as lower ones because of squaring the deviations). Block distance = The sum of absolute deviations. Please note: Since it is also possible to include variable values in the analysis, all code frequencies and variable values are z- standardized previously beforehand. 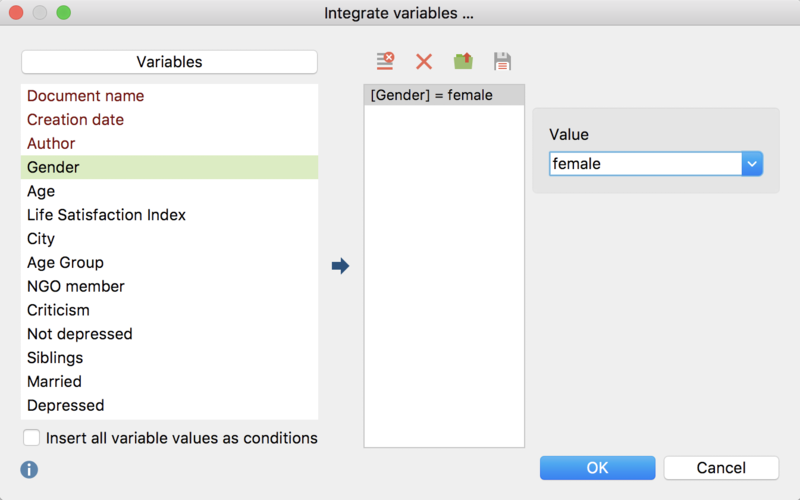 If you want to include variables in addition to codes in the similarity analysis, click the Integrate variables button. 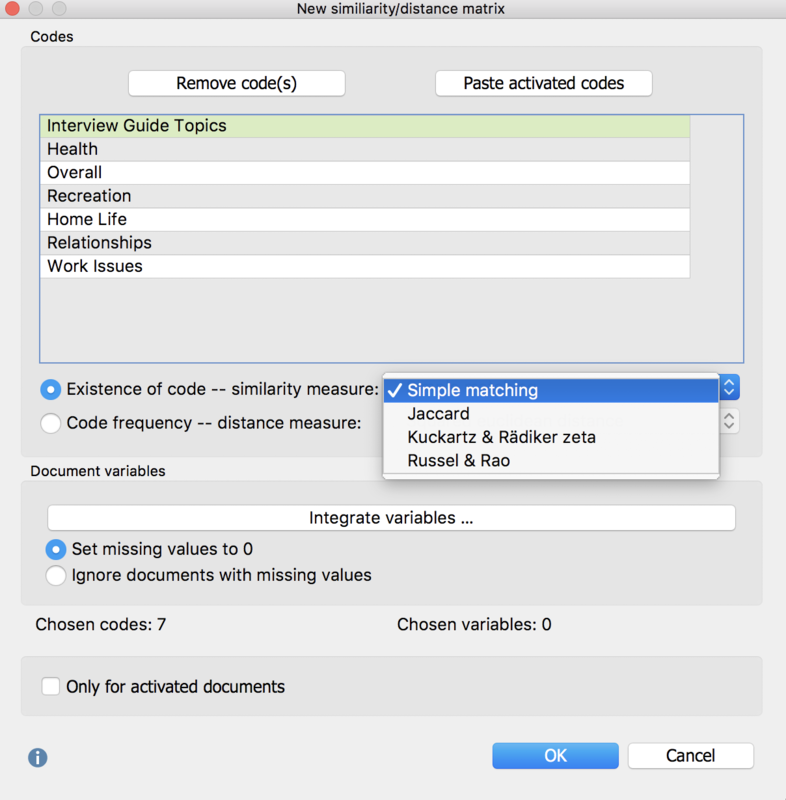 If you selected “Existence of code” as the type of analysis, you can then select which variable values MAXQDA should evaluate in the dialog window. If the selected variable value exists in both documents, this is evaluated as a match (type “a”). In the dialog window, only variables of type “text”, “true/false”, “Date” as well as categorical integers or floating-point numbers are listed. If you selected “Code frequency” as the type of analysis, another dialog window will appear that contains only integer or floating-point variables, that are not marked as “categorical”. Set missing values to 0 – If a variable value does not exist, it is set to 0 due to the z- standardization of the average. In this option, the document with the missing value is taken into account in the analysis. Ignore documents with missing values – If in a document of one of the variable values is missing, the entire document will be ignored in the analysis. The default shadowed color helps to interpret the cells, which in a similarity matrix can have a value of 0 (no similarity) to 1 (identical): The darker the green, the more similar the two documents are in terms of the selected code and variable values. In the figure, for example, you can see that “Joanna” completely coincides with “Kelly” both in their codes and their variable values​​. The matrix is sortable: Click on a column header to sort the documents in the rows according to their similarity to the clicked document. New similarity/distance matrix – Calls up the dialog window where you can create a new matrix. Delete – Deletes the selected matrix. Names, columns: none, short, full – Controls column width. No color highlight – Turns off green highlighting. Color highlight refers to whole matrix – The highlight color takes into account the value of the cell. The same values will have the same highlight color in the table. Color highlight refers to columns – In each column, the colors are graduated from white to green. In this way, you can see at a glance which documents are particularly similar to the document in the column. The same values ​​in the matrix may be different colors. Color highlight refers to rows – In each row, the colors are graduated from white to green. In this way, you can see at a glance which documents are particularly similar to the document in the row. The same values ​​in the matrix may be different colors. Distance matrices look identical to similarity matrices, however their interpretation is the reverse: The lower the value in a cell, the more similar the two documents are. In the left pane of the window you can see the similarity and distance matrices created earlier in the project. They can be renamed with a double-click, or deleted by clicking the Delete icon in the toolbar. Tip: In order to ensure the transparency of the analysis process, the matrix name and selected settings will be displayed in the tooltip if you hover over a matrix name.